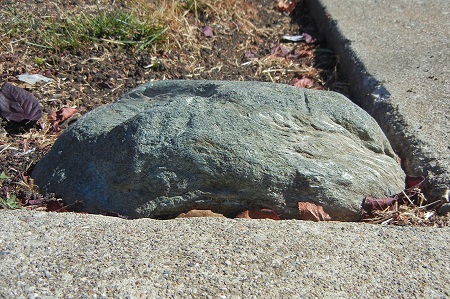 I enjoy seeing some of Oakland’s more unusual rock types when they show up in people’s yards. It shows that people like our rocks. This boulder of actinolite may not actually have come from Oakland, but it could have. Perhaps a resident spotted it in a streambed and said, “I give this to me.” It’s clearly not part of a professionally assembled landscape package. This entry was posted on 26 October 2013 at 11:17 am and is filed under Oakland stone. You can follow any responses to this entry through the RSS 2.0 feed. You can skip to the end and leave a response. Pinging is currently not allowed.